Tuesday March 20th 1923 I went in town with Mrs Falk at 8:30. Was at Pickens and then made a call on The McBrides. I next went to The Club rooms to order R R reservations and wrote to Hattie. I was at Pickens for dinner and They took The McBrides and myself to ride all over town and to the river. I stopped at The [Dreha?] to come home with Mrs Falk. Another letter from Hattie says Birdie is sick and Mrs Blackman is dead. Wrote to Laura. 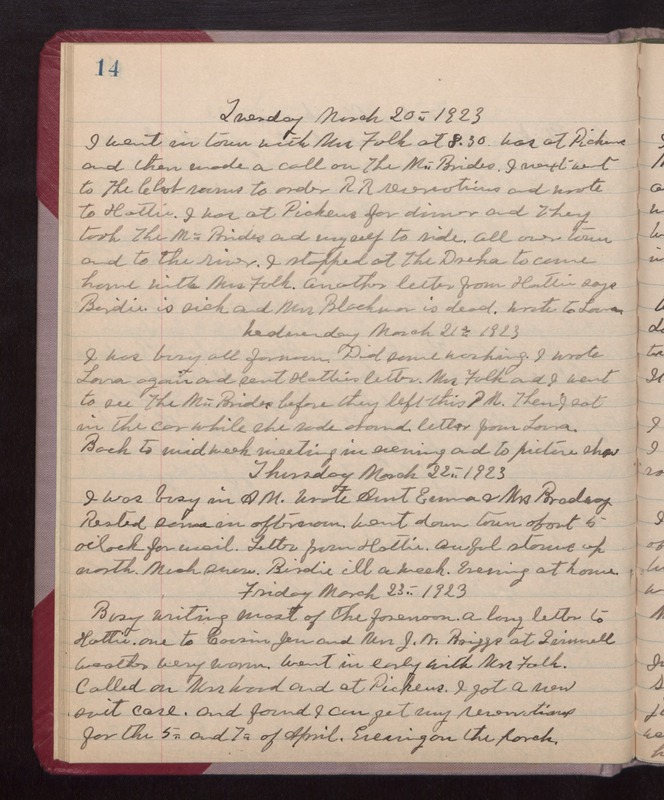 Wednesday March 21st 1923 I was busy all forenoon. Did some washing. I wrote Laura again and sent Hatties letter. Mrs Falk and I went to see The McBrides before they left this PM. Then I sat in the car while she rode around. Letter from Laura. Back to mid week meeting in evening and to picture show. Thursday March 22nd 1923 I was busy in AM. Wrote Aunt Emma & Mrs Bradsay. Rested some in afternoon. Went down town about 5 oclock for mail. Letters from Hattie. Awful storms up north. Much snow. Birdie ill a week. Evening at home. Busy writing most of the forenoon. A long letter to Hattie, one to Cousin Jen and Mrs J N Briggs at Grinnell. weather very warm. Went in early with Mrs Falk. Called on Mrs Wood and at Pickens. I got a new suit case, and found I can get my reservations for the 5th and 7th of April. Evening on the porch.